The ‘Opulent’ Collection by Julian Stephens features unique, modern fine jewellery inspired by classical influences in this instance this design the ‘Bernhardt’ ring is inspired by the Art Nouveau style and decorative Art of Alphonse Mucha and his muse Sarah Bernhardt, a French film star and actress. 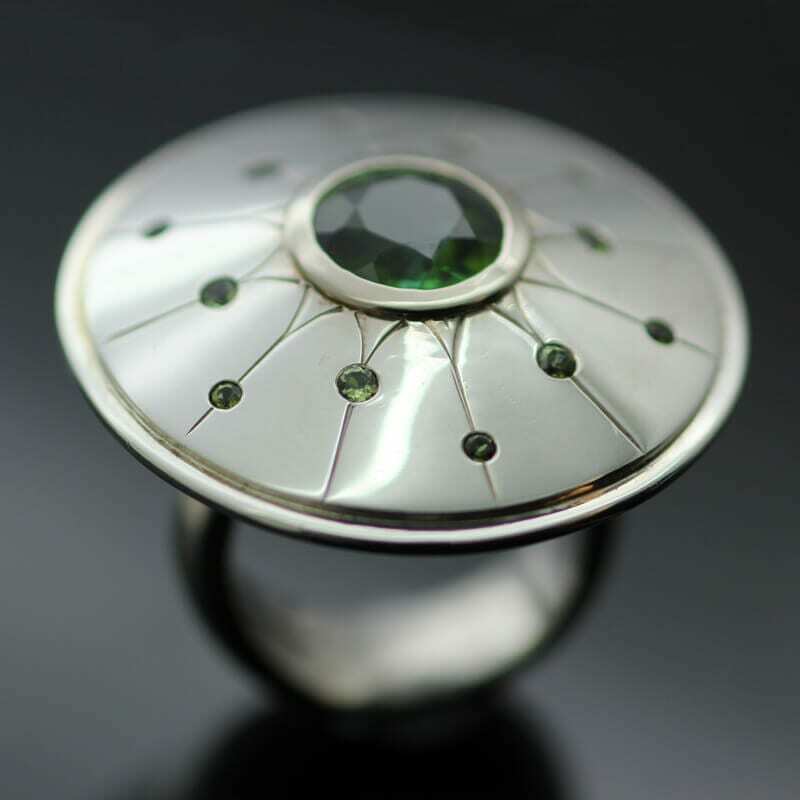 This glorious modern statement cocktail ring design is a fitting tribute to the glamour and elegance portrayed by the Arts & Crafts movement, adorned with a spectacular Round Brilliant rich green Tourmaline gemstone, surrounded by a collet setting of solid 18ct White Gold. 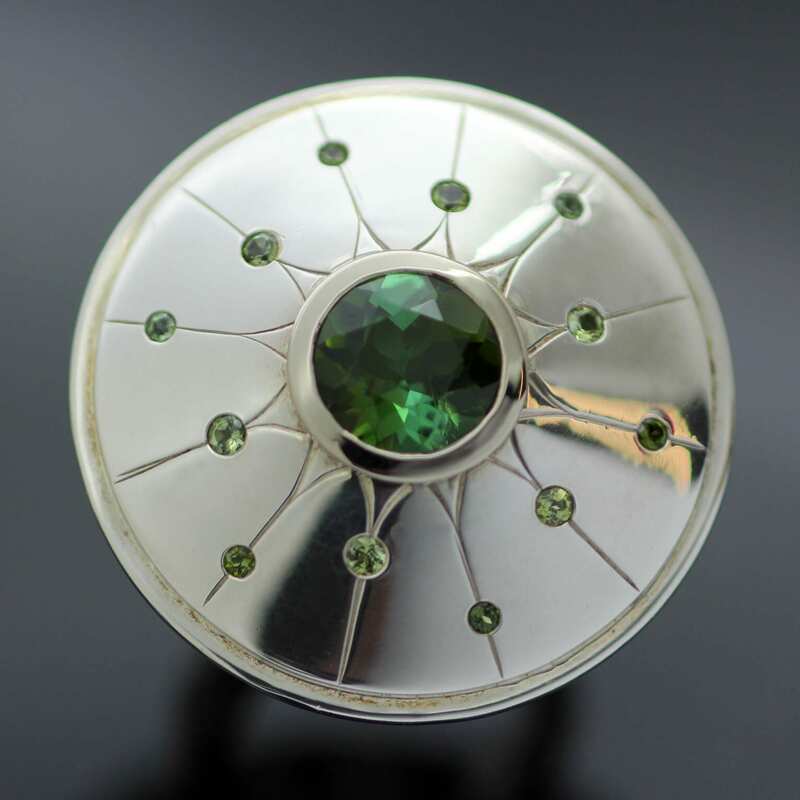 This contemporary ring is further enhanced by smaller Round Brilliant Green Sapphires flush set in the gently curved surface surrounding the Tourmaline centrepiece. 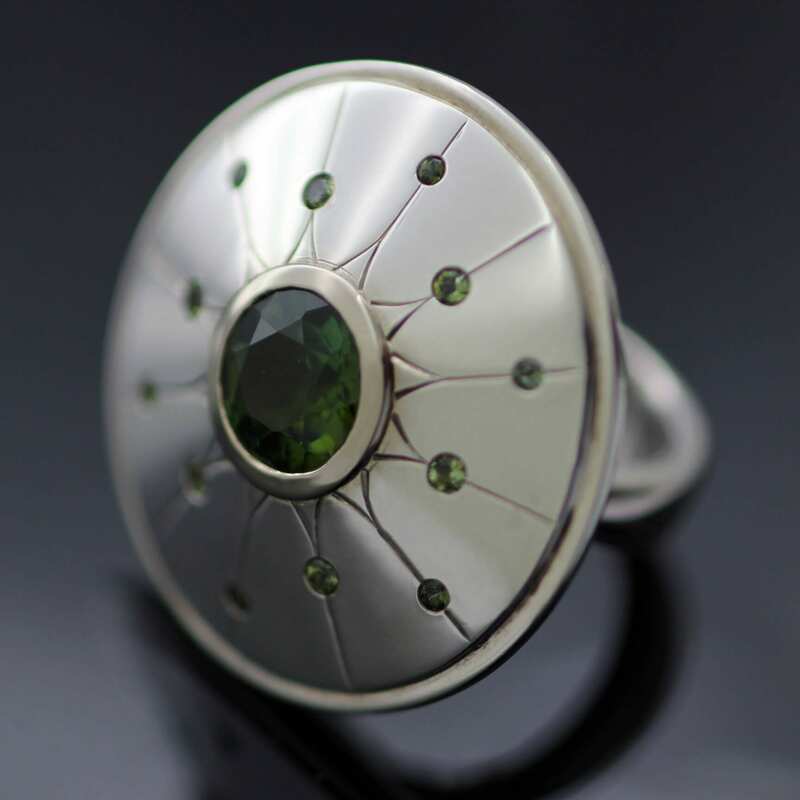 This dramatic circular ring design is crafted from solid Sterling Silver, adorned with hand engraved sleek modern lines to create a sunburst motif, enhanced by a dazzling array of glittering green precious gemstone. The beautiful solid Sterling Silver cocktail ring is finished with delicate hand engraved detailing, subtly echoing Art Nouveau detailing and is completed with a high shine polished finish to the solid Silver metal, enhancing the alluring sparkles of the glittering green gems. The unique and elegant ‘Bernhardt’ cocktail ring proudly bears Julian Stephens exclusive maker’s mark and is fully Hallmarked.